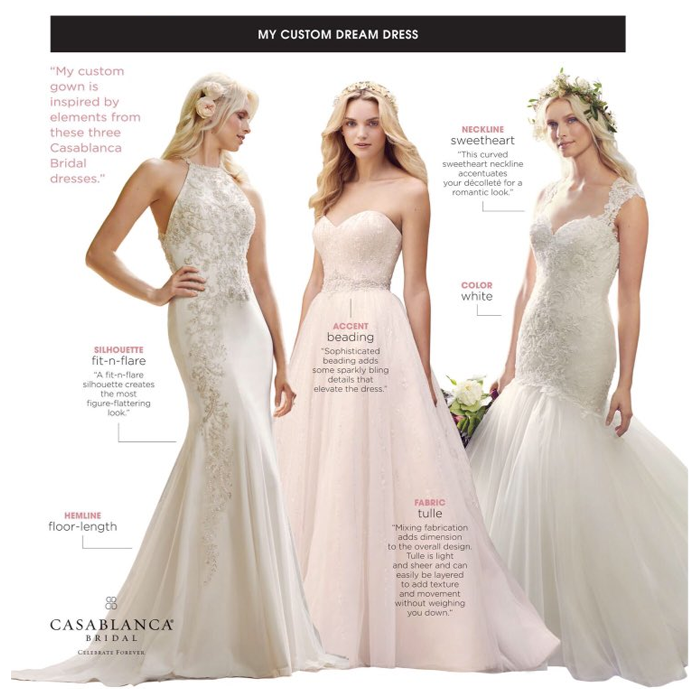 We carry Casablanca "custom designs". You design your gown! We have your classic to the ‘getaway gown’ for your perfect wedding day. Whether it’s veils, headpieces, shoes, jewelry or intimate apparel, Blush Bridal will find it. We think different. We are different. We believe you can get a gorgeous gown at a great price, but most of all, we are there for you up to your wedding day. We know brides need honest feedback and personal support. When you become a ‘blush’ bride, you will experience all those special bridal moments! We have a beautiful collection of bridesmaids, mothers of the bride/groom and prom/speciality gowns to choose from. If your wedding party should need tuxedos, we have a handsome selection of rentals. This is the most exciting event of your life, so the stress-free atmosphere can only enhance your wedding planning. Walk-in’s are always welcome to browse our latest styles and if you should need an appointment, we’ll make that happen along with our congratulations on your engagement! Appointments are available 7 days a week. Call 603-343-4439 or text to 603-312-4898 for your private appointment!